Description: James Madison, Jr. was an American statesman and political theorist and the fourth President of the United States (1809-1817). He is hailed as the "Father of the Constitution" for being instrumental in the drafting of the United States Constitution and as the key champion and author of the United States Bill of Rights. He served as a politician much of his adult life.. 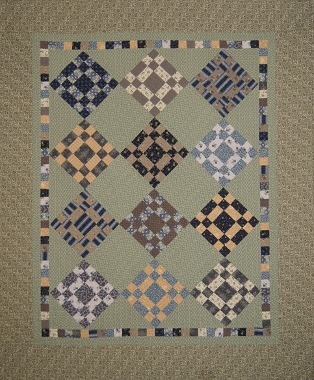 The block chosen for this quilt is called the Courthouse Square, an apt block for a man who spent many years in politics. This little quilt is a companion to the Dolley Madison quilt, named for the wife of James Madison.